My WP notification thingy (technical term) is not working properly and so I am going back to old posts to see who I’ve missed. So sorry, if I missed your comment. Especially frustrating (and funny), considering my post (http://wp.me/p3i5jo-j4) about comments! In the top right-hand corner of your blog page is “New Post” then an icon that lights up when you have a new comment from one of your posts. That’s the “notification thingy” I’m referring to. Right? I forget how long it took me to figure that out. I used to open each blog post to look for and reply to comments. Once I realized that the icon became red when I had a new comment, I never went back to my old procedure. Earlier today, I opened a recent post to copy something from it, and I noticed a comment that didn’t have my reply under it. Weird. Then I noticed another one. I checked to see if there was a red “2” under my site title on the top left; nope, then I opened “Comments” in the dashboard, and they were highlighted here. But the other unanswered comments that I found were NOT highlighted in the dashboard comment section. As I opened and checked my previous posts, I found one or two unanswered comments in almost every post this month and some in November. Sheesh! So, there I was writing a post about comment courtesy, when I was a culprit myself! How embarrassing. Okay, I’m over it. I laughed at myself, cussed WordPress, and replied to my errant comments. I stopped looking by the mid-November posts, because I think I got them all. If I didn’t, I sincerely apologize for this mess. I value each and every person in this community. Looking back at all those posts was really good for boosting my I-am-loved level. You people are incredible supporters! My photos, writing, grieving and happiness have enough value and meaning that you all chime in to encourage and cheer. This was like a gift wasn’t it? I have to consider that this “gift”/glitch that made me look back at the wonderful comments, may not have been an accident. Was it the universe telling me to wake up and smell the roses in my life? The roses being YOU and YOU and YOU. Was I being told to un-snag myself from the thorns on the lower branches and make my way to the beauty at the top of each branch? And how about the writing and photos that I shared? Basically, once I shared them with you, I was done with them. I remember the feeling of racing to get them posted and then…I never looked at them again. The thingy in the top corner would light up and I’d reply right there, without ever returning to the post itself. Hmmm. I think I need to stop using the thingy! Duh. It took more time, but I got a lot of happiness out of looking at the old posts, photos and comments. I’m a convert! Amazing lessons and gifts show up in the funniest places. Like in a glitch, in the thingy, in the top corner. Categories: Challenges Prompts Contests, Phall Photos, Writing Journal | Tags: comments, Friends, replies, support, wordpress, WP | Permalink. I, too, have had thingy issues. It can drive a person batty!! Simplistic wonder. What a beautiful bubble! I may have thingy issues and not know it. Sometimes I see the orange dot next to comments in the left panel with a number in it and I go there and don’t see anything amiss. So i dismiss. Many times those are pingbacks, which I learned the hard way:>) They are barely light pinkish I think. I just hit “approve” and move on. It’s worth looking through comments on a couple posts, just in case. For someone who’s taken on a huge challenge you’re doing very well. I honestly know how hard it is to post daily which is why I’m usually a once a week man now ( It’s an age thing). Coming across old posts and some of the wonderful comments is real treat isn’t it.It’s easy to forget how kind, how supportive or how funny some people are. 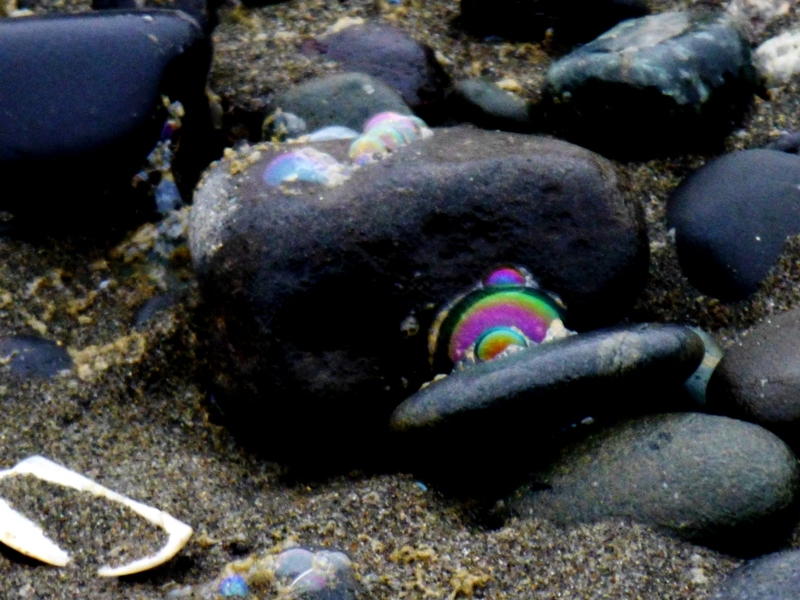 Bubbles on beach stones, what could be more whimsical. Thanks, Patti! Glad you liked it, Marian. Thanks for stopping by. It’s possible to find incredible beauty even in pollution. Love it. I never use the WP notification thing, but go to WP a few times a day and look at the column on the left where it says comments. It’s been reliable as far as I know although occasionally a response ends up in the spam box where I retrieve it. But in general, as most other writers, I’m often in a messy computer stew. Have good help with my son (who owns a computer solutions company) and Jill Swenson when I get really stuck. One a day. You’re a trooper. Any more eagle photos? Just read the last postcards. Oh, Patti. Ouch. Sending hugs. Need to go to the beginning. It’s a tug to love the bubbles without considering their source. I really think that this is a glitch between Vista, Chrome and maybe my virus detection program. Every day I try a new solution. Actually, it isn’t Chrome because it happens when I try the IE browser too. (Ignore me, I’m thinking/typing out loud:>) Have to wait for the first to take to doc. I have eagle photos from Alaska that will give you big smiles, I’ll see what I can do. As I was reading your post and scrolling through comments my thingy lit up… 😀 what I’d like to know is if there’s a way to organize blogs you like to read the most so you can find them first. I have my own demons when it comes to word press. Still, I wouldn’t give it up… too many nifty people here. Oh, I agree. I want my laptop cremated with me, just in case there’s an afterlife and I can still have my blog friends:>) Sick, I know. As far as I know, you can get them in email or on the reader, but no way to sort them. I only use the email follow if they aren’t on WP. With the email follow, I figured out by mistake that most go to my spam folder. Just for fun I decided to see why the folder was suddenly getting so full. 99% was from WordPress. By the same token, I don’t want 1000+ posts I haven’t replied to, I don’t need others’ private conversations, I’d like to keep up with my conversation and all those involved with it whether they’re responding to me or just part of the general conversation. You know what I mean? I find WordPress not so user friendly, but I’m delighted with all the people I ‘meet’. I’ve given up trying to figure it out. It doesn’t always work. I know when WordPress is updating, at least I think that’s what it is, when I go through a spell that doesn’t populate my bar along the top for my administrative stuff. You know, that black bar that runs across. If that’s not there then I don’t get the edit option along above each post. I’m forever rearranging and putting older posts into other pages so I have to go in from a different place until it comes back. This is the best idea I’ve heard in a while. We cremated Vic with his 3 books (in case he needed his ideas), with chocolate and pasta, with coffee beans to stay awake in the bardo transition (Buddhist idea), and with photos of family and teachers and students. There’s more to this story and lots more in the cremation box, but I want to be cremate with my laptop. Love it. Remind my sons, OK? So is the story in your book or will you post it on your blog?